SHINING EXAMPLES: Awardees sharing a post-ceremony photo-op with culture minister, Olivia 'Babsy' Grange (centre) and the IOJ's Marigold Harding (left). ENTERTAINMENT legend Freddie McGregor joined members of the Nexus Performing Arts Company on stage for renditions of some of his timeless hits; Myrna Hague (on vocals) and Marjorie Whylie (on piano) teamed up for a spirited rendition of “The Impossible Dream”; and Tanya Shirley drew a standing ovation for her pitch-perfect response on behalf of the awardees. Those and other key moments made last Thursday’s Musgrave Medal awards ceremony, inside the Institute of Jamaica’s Lecture Hall, one of the most memorable in recent history. 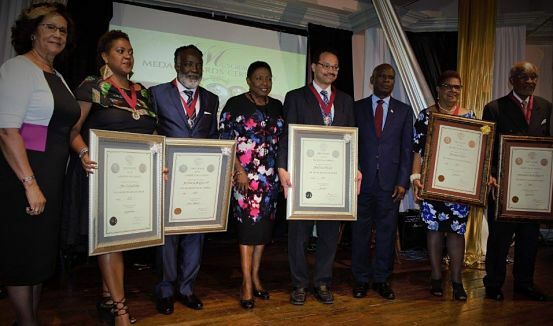 Six outstanding Jamaicans were honoured during the ceremony for their career achievements and contribution to their respective professional fields. The lone gold medal went to Dr. Herbert Ho Ping Kong (who was unavoidably absent), for his boundary-pushing work in the field of science. The Canada-based doc, who received the Order of Jamaica at King’s House in 2015, is considered one of the world’s foremost practitioners of internal medicine. McGregor, the still-reigning captain of the Big Ship who has given the Jamaica music industry some five decades of melody-making (and 30 reggae albums), was presented with a silver medal. Professor Daniel Coore, a computer science maverick and expert on robotics and programming – and Shirley, a fellow UWI Mona-based educator, who’s released the acclaimed poetry collections The Merchant of Feathers and She Who Sleeps With Bones – were also honoured with silver medals. Bronze medals were presented to scientist Eleanor Jones and distinguished man of letters Dr. Basil Bryan. Shirley hit the nail on the head for her fellow medal recipients when she noted, during the awardees’ reply, that receiving such a prestigious award “in the middle of our fruitful seasons and not at the end of our careers” makes the honour all the more alluring and appreciated.